Since 2006 when G24i acquired the license then pioneered the development of a breakthrough, low-cost, roll-to-roll manufacturing process which can support a range of diverse applications based on the technology invented by the internationally acclaimed chemist, Prof. Michael Grätzel, Ph. D, Director, Laboratory of Photonics and Interfaces at the Swiss Federal Institute of Technology (EPFL) in Lausanne. Marks an important milestone for G24i, making it the first commercial manufacturer of Dye-Sensitized Solar Cells (DSSC) technology for mass consumer use in the world. 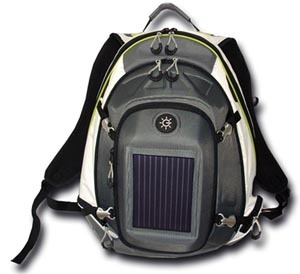 The G24i photovoltaic panel will be integrated into a range of bags targeting the consumer market. The panel will harvest energy while used outdoors as well as in low light conditions indoors – a unique advantage of the G24i DSSC module – and repower mobile electronic devices such as mobile phones, e-books, cameras, and portable LED lighting systems. And it is been announced that the first commercial shipment of DSSC photovoltaic modules to Hong Kong-based consumer electronics bag manufacturer, Mascotte Industrial Associates. Mascotte will display the different styles of bags for the first time at the Hong Kong Electronics Fair, on October 14. Expected the first commercial designs will be available to consumers from Concord Keystone and Scratch Tracks by December.